Bugs Bunny is an animated rabbit/hare who appears in the Looney Tunes and Merrie Melodies series of animated films produced by Leon Schlesinger Productions which became Warner Bros. Cartoons in 1944. Today, he is the corporate mascot for Warner Brothers. Labels: animation, cartoon, looney tunes, tv show, Warner Bros.
Glad you are "back." We all missed the great creations. 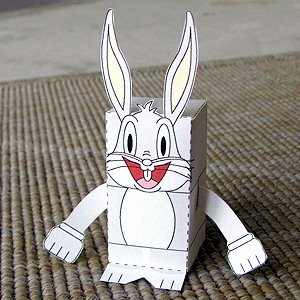 Loved Bugs..."Eh, what's up, Doc?" since I was a kid. How about Daffy, Porky, and The Tasmanian Devil?